Backyard cottage designed by CAST architecture, located in Seattle’s Greenwood neighborhood. Photo by CAST architecture, used with permission. When it comes to urban homes, it’s hard to imagine anything less threatening than granny flats. But surprisingly, in Seattle last year instill fear they did, provoking a handful of anti-housing activists to appeal proposed rule changes intended to spark construction of in-law apartments and backyard cottages. And in an exasperating turn of events, the appeal was upheld. Of all the 65 recommendations in Seattle’s Housing Affordability and Livability Agenda (HALA) plan, these homes—collectively known as accessory dwelling units (ADUs) in urban planner-speak—should have been one of the easiest wins. Tucked away on single-family lots, ADUs expand access to great neighborhoods for families who can’t afford a pricey, larger detached house. At the same time, they let more people live near jobs and services, shortening carbon pollution-spewing commutes and reining in sprawl. Still, in many cities throughout Cascadia and the United States, the road to legalizing ADUs has been long. In Seattle’s case, that road hit a wall made of outdated thinking on urban development encoded in state laws that, ironically, were enacted to protect the environment. Because of the appeal, the city must now go back and conduct an exhaustive environmental review that is unlikely to substantially change the proposed ADU reforms. All it will do is squander time, postponing the fixes by about two years to mid-2018. And every year of delay is a lost opportunity to create hundreds of new homes for people who do, or who want to, call this city home, all because a tiny minority of residents don’t want their neighbors to offer small rentals in their basements and backyards. It’s a phenomenon reminiscent of what writer Alex Steffen calls “predatory delay,” in which the fossil fuel industry has stalled action on climate change for its own benefit. There are consolation prizes available to Seattle from this damaging setback, and I’ll get to them. But first, I’ll review the policies that can unlock ADU homebuilding, then tell the disheartening story of the appeal of Seattle’s proposed ADU rule changes, and finally, lay out the flaws in the obsolete regulations that led to all the trouble. What’s holding back Seattle’s ADUs? provided great latitude on size, height, and placement of ADUs. In 2016, a year when developers opened nearly 6,000 new apartments in the city, Seattle added only 156 ADUs, up from 116 the year before. Consequently, Vancouverites have been adding roughly 1,000 ADUs per year to their single-family neighborhoods and now have some 27,000 total. Portland got it right on three of these four rules. The exception is that the Rose City still limits ADUs to one per lot. But still, it has seen the number of ADU homes ramp up considerably, as shown in the chart below. The city issued about 600 permits in 2016, and by this year’s end it will have an estimated 1,900 completed ADUs citywide, an increase of about 300 per year since 2015. In contrast, Seattle’s current regulations fail on all four counts. As a result, despite high and rising rents (and soaring home equity that owners could borrow against to finance ADU construction), recent ADU production lags well behind both Vancouver and Portland. In 2016, a year when developers opened nearly 6,000 new apartments in the city, Seattle added only 156 ADUs, up from 116 the year before. Chart created by accessorydwellingstrategies.com based on data collected by the Portland Bureau of Planning and Sustainability. Note that not all permitted ADUs are built, and some ADUs are built without a permit. In May 2016, ten months after HALA recommended the four rule changes above, Seattle leaders released an ADU plan to implement those recommendations, with a few caveats. The city asserted that the proposed changes did not require completion of an Environmental Impact Statement (EIS) under the Washington State Environmental Policy Act (SEPA), because it would cause no appreciable harm to the environment—called a “determination of non-significance” (DNS). A month later, the Community Council of Seattle’s affluent Queen Anne neighborhood appealed the DNS. The case went to city hearing examiner Sue Tanner, who in December sided with the Community Council. The city now must conduct a full-blown EIS, a process that typically takes at least a year and costs several hundred thousand dollars in city staff time and fees to consultants. Tanner ruled that the city’s DNS was flawed for several reasons, some of which were procedural. Here, I’ll focus on the more pertinent and meatier allegations: that the DNS did not sufficiently analyze potential impacts on existing housing and displacement, parking, and public services. The ruling states: “The evidence here shows that the legislation would adversely affect housing and cause displacement of populations.” The evidence in question was provided by an economist who testified that allowing both an in-law apartment and a backyard cottage would attract “outside investors” enticed by the prospect of renting three units on a single lot, who would buy older cheaper houses, demolish them, and replace each with a new house and two ADUs. An urban planning consultant added that because investors would pick off the cheapest houses first, the proposed rule changes would cause displacement of lower-income “minority populations,” accelerating gentrification and diminishing the city’s diversity. In response to previously voiced concerns about this “outside investor” scenario, Seattle’s proposal included a requirement that the owner live on-site for a period of one year after ADU construction was completed. City planners wrote that the rule would “ensure that speculative development interests are not able to develop single-family lots with ADUs and backyard cottages.” It turns out, though, as noted in the appeal, that there’s a workaround: an off-site owner could create a Limited Liability Corporation (LLC) and grant a tenant a tiny fraction of ownership. In the majority of cases in-law apartments and backyard cottages are added to existing homes. But for the sake of argument, assuming that some amount of teardowns through speculative redevelopment would occur, even under those circumstances, is the ruling’s contention about displacement correct? Short answer: no. That’s because the hearing examiner—like the plaintiffs’ expert witnesses—got it backwards: building more ADUs is not a cause of displacement; it’s a cure. As I detailed in a previous article, economic displacement (caused by rising rents) is displacing far more, probably at least ten times more, people in Seattle than is physical displacement (caused by demolition of existing low-cost housing). In the (likely rare) cases when an existing home is replaced by a new house with an ADU, the net effect citywide is less displacement, because creating more homes addresses the primary cause of rising rents: not enough homes for all the people who want to live in Seattle. The teardown of a low-value house might cause the physical displacement of that house’s tenants. (It also might not: the previous residents may be the owners, or the teardown may be vacant because it is unfit for habitation. In any case, Seattle’s cheapest houses are already disappearing quickly to make way for exhorbitantly expensive new houses built to the maximum size allowed.) But preserving that existing house and forgoing a new ADU (or two) will only speed the increase of rents in cheap houses by exacerbating the housing shortage that is driving up prices across the board. Low-income families will pay more to get the same low-quality housing. Not only that, when there’s a shortage of homes, the housing market is like a cruel version of the game of musical chairs. Those with money always win; those without always lose. Across the city, every ADU that does not materialize is like another a chair taken out of the game, and that translates to a low-income family displaced. Conversely, when one home is transformed into two, even in the worst case scenario where a family gets physically displaced from the original house, those two open “chairs” mean that two low-income families elsewhere in the city will not be forced out. I am not trivializing displacement caused by a teardown. As Seattle grows, city policies and investments can support vulnerable communities so that they can stay in place and benefit from that growth. However, there is no escaping the fact that every home not added to Seattle’s housing stock leads to one fewer low-income family that can live in the city. The people who are indirectly displaced when construction of new homes is prevented are every bit as harmed as the people displaced by teardowns. Worse yet, the hearing examiner’s ruling not only has it backwards on ADUs and teardowns but also advances a perilous line of thinking for affordable housing in general. If teardowns for the sake of ADU construction are a threat to affordability, the same is true for any other form of homebuilding. When there’s demand for housing, any change of laws that allows larger buildings will accelerate redevelopment. And the homes that get replaced first will be the cheap, worn-out, neglected ones—the ones with the lowest rents. But that’s not all there is to the story, because except for the case of single-family houses, redevelopment invariably yields a larger number of homes, easing competition. More players in the game of musical chairs get a seat—that is, a home they can afford in the city. The pressure pushing up rents is relieved, from the top of the market all the way to the bottom. Thus, as tempting as it may be to impose restrictions in the hope of saving low-cost homes, doing so only makes things worse for affordability overall. Backyard cottage designed by Nest Architecture & Design, located in West Seattle. Photo by Alex Hayden Photography, used with permission. Adopted in 1971, Washington’s State Environmental Policy Act (SEPA) comes from an era of horror stories about polluted cities that spawned a reflexive inclination to limit urban growth. It calls for an assessment of all the negative environmental consequences of major government decisions. Will more ADUs increase a city neighborhood’s car trips, crowded street parking, local air pollution emissions, energy consumption, or noise? What SEPA doesn’t require, though, is equal consideration of positive impacts. reduce pollution of water and air—and therefore climate change. Compact, transit-rich, walkable, mixed-use, mixed-income cities are critical ingredients to a sustainable future. These benefits of compact communities—of density—are ubiquitous in the past three decades’ research on cities. Indeed, the main lesson of that entire body of work is that compact, transit-rich, walkable, mixed-use, mixed-income cities are critical ingredients to a sustainable future. Seattle officials shouldn’t have to prove this anymore than they have to prove that hydro- and wind-powered Seattle City Light electricity is better for the planet than the coal power that many rust belt cities rely on. So the fact that a handful of homeowners from an affluent neighborhood successfully used SEPA to stall ADU liberalization is, to understate the case, ironic. If there is anything of redeeming value buried in the hearing examiner’s decision, it is the chance for the City of Seattle to complete an EIS that once and for all lays to rest the ruling’s spurious arguments and demonstrates how the net positive benefits of ADUs dwarf the negatives. Ideally, such an EIS could lay the foundation for city rule changes that would exempt infill housing construction from SEPA entirely. First and foremost, the city can address the displacement issue directly to head off future attacks through SEPA against proposals to spur in-city homebuilding. Addressing it directly means establishing the fact that when there’s a shortage of housing across a city, adding new homes reduces net displacement, full stop. Even if the new homes are more expensive than the old ones. Because it all comes down to basic math: the bigger the gap between the number of homes and the number of people who want them, the more the competition for scarce housing floods down the market and pushes people with lower incomes out of the city. When there’s a shortage of housing across a city, adding new homes reduces net displacement, full stop. It follows that every time a speculative developer replaces an existing house with a new one that includes an ADU (or two), it’s a net win for housing equity. Conversely, every time a teardown is replaced with the largest, most expensive house that will fit on the lot but that can only accommodate one family, it’s the worst possible outcome for equitable access to housing. If city officials fail to unequivocally demonstrate these fundamental truths, they will lose the argument from the start. Requiring the owner to live on-site removes the 20 percent of Seattle’s single-family houses that are rentals from the pool of possible new ADU sites—sites where adding ADUs to existing rental houses would cause zero physical displacement. Plus, compared to typical homeowners, landlords are more likely to have the financial resources and expertise to invest in new ADUs. For many private homeowners, financing is the biggest obstacle to developing an ADU on their own. Risk-taking investors can play a key role in jump starting ADU construction by blazing the trail and establishing the design, construction, and finance infrastructure for ADUs in Seattle that will then make it easier for homeowners to get into the game. Barring non-resident investors from building ADUs will kneecap production, stifling the potential for ADUs to ameliorate Seattle’s housing shortage. Some cities have rationalized owner occupancy requirements as a means to “preserve neighborhood character,” based on the perception that rental units may not be well maintained. But if this argument were valid, it would also justify applying the same rule not just to ADUs but to all rental homes, including everything from single-family houses to duplexes, rowhouses, and large apartment buildings. Singling out ADUs is discriminating against renters in the most sought-after residential neighborhoods. In a similar vein, some Seattle officials hope to assuage fears that speculative developers would build “backyard cottages that don’t fit the character of the neighborhood.” Such arguments prioritize some people’s aesthetic tastes over other people’s need for housing. Regarding parking, yes, removing the off-street requirement for ADUs might increase competition for street parking. A 2014 study in Portland found that on average, each ADU generates 0.46 cars parked on the street. But requiring off-street parking has numerous and hefty adverse impacts. Overall, off-street parking quotas make housing more expensive and deepen car dependence—in direct contradiction to two of Seattle’s most urgent aspirations for the future. Besides, the City of Seattle has no obligation to provide convenient parking, free of charge, on publicly owned streets, to single-family homeowners—the vast majority of whom already have plenty of car-storage space on their own property. In an age of impending climate crisis, in a city where close to half of greenhouse gas pollution comes from cars, it’s ludicrous that a policy change as benign as allowing more ADUs can be contested through the State Environmental Policy Act over parking. The SEPA appeal ruling also cited lack of analysis of public infrastructure, but most of these concerns are based on an outdated context. First of all, as an article I will publish soon details, in most of Seattle’s single-family areas, population density has decreased over the past few decades with the decline in average household size. In other words, in the not too distant past, existing infrastructure adequately served more people in most neighborhoods where ADUs would be built. The ruling calls out stormwater management in particular, but today’s stringent regulations ensure that any new construction will not increase polluted runoff, and in fact, will likely reduce it. Furthermore, urban infill projects like ADUs typically cost less to serve with infrastructure compared with the alternative scenario of new homes forced out to more sprawling, suburban locations. Here again, the appeal ruling ignores modern reality—in this case, that urban infill housing lowers per-capita public expenditures on infrastructure. Backyard cottage designed by live-work-play, located in Seattle’s Columbia City neighborhood. Photo by Cindy Apple, used with permission. That adding homes to existing cities is a net positive for both people and the planet is an utterly uncontroversial principle of urban planning. One of the gentlest ways to do that is by allowing ADUs into areas otherwise reserved for single-family houses. Yet in Seattle, Washington State’s environmental laws enabled an obstructionist minority to torpedo a policy change that would have unlocked these much-needed, flexible housing options. The harm of delay is real: based on ADU construction rates in Vancouver and Portland, every year Seattle’s ADU rules remain unfixed and impede production, hundreds of families are losing the opportunity to rent in-law apartments or backyard cottages. Instead, they are competing for existing homes, and as the bidding wars cascade down the market, the lowest-income families are being displaced from Seattle. Rents are rising faster for everyone. Seattle’s most desirable neighborhoods are remaining as exclusive as ever, off-limits to people of modest means. The delayed densification of the city’s most auto-dependent zones is hamstringing its progress beyond carbon. Who is winning from the EIS delay? Almost no one, save for a few extreme NIMBYs who want to freeze their neighborhoods in amber, or who care more about street parking than welcoming new neighbors. Who loses? All the city’s renters, who in the best case will pay a little more because of the added competition for apartments that the ADU delay is intensifying, and in the worst case may be forced to find somewhere to live in a cheaper location outside Seattle. But most of Seattle’s single-family homeowners lose, too: the majority of them support liberalizing ADU rules. 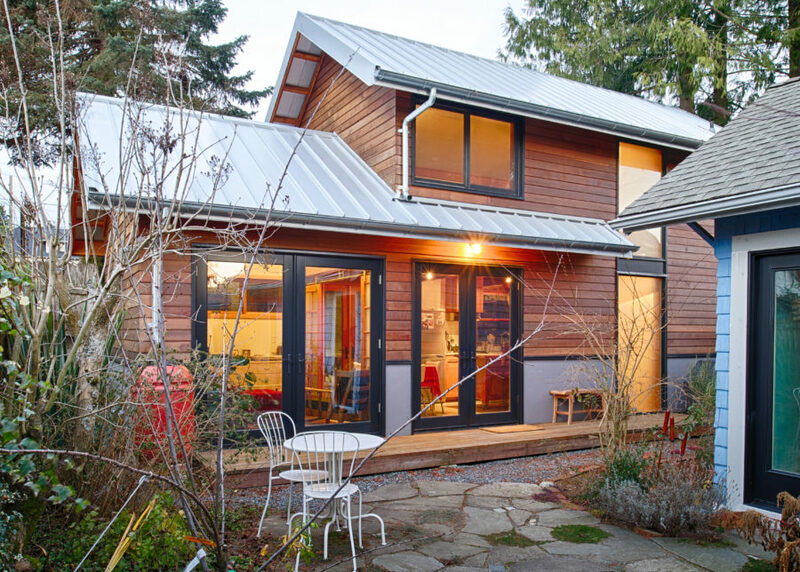 ADUs not only fit Cascadians’ tolerant, welcoming values and laidback lifestyles, but they increase home values and income potential for homeowners. Oh, and the planet. The planet loses, too. Seattle’s own study on DADUs done a few years ago looked into the reasons why homeowners build them at an average cost of $50K: personal use (studio/work space) or to house a family member. Building them as rentals is not the primary reason. Therefore, why does everyone seem to think that any rush of DADU construction would result in a significant impact on the housing market? Having lived in a backyard duplex – I can say from experience it is impossible to live in someone’s backyard and NOT run into each other – your lives will overlap despite your best intentions. And I am also a landlord – THAT can be a difficult role to be in. Where is your evidence people are itching to invest tens of thousands of dollars to become landlords? What makes you think that even if someone does jump into this, they won’t be tempted by making even MORE money buy raising the rent to the typical $ per square foot? If ADUs are providing housing, they are helping affordability. The owners get to set the rent just like any other landlord. What’s the problem with housing a family member? Without that (D)ADU, that family member would be taking up a unit somewhere else. I wanted to build a DADU for my parents, but it’s looking more likely (given the current ADU restrictions) that they’ll end up renting or owning a unit somewhere else in Seattle. True! Tis a better solution for disabled and elderly people compared to a nursing home! Most 55+ housing is mobile home parks! Personally, I feel that ADU’S are more esthetically appealing to the eyes! ADU are a good idea if you live in a city with a good public transit system. Isn’t the city of Seattle completely surrounded by other cities- so it has no place to expand? Redevelopment of existing neighborhoods really is the way you will get add housing stock. I do not see the units being built geared towards families without building a mini mansion in your backyard. The nice part is you would have a expanded stock of one bedrooms and studio apartments. The big house would be the house for a family. I think sharing a backyard would be more palatable if you were all family. A group of alley houses could turn a dumb of a alley into a mini street- with some creative thinking to work with garbage pickup, mail delivery and parking. It might be interesting to give a property tax break if the unit is ada compliant and built with age in place criteria. Production of ADUs won’t happen in a significant fashion unless a facilitation mechanism is created, e.g., a program like a CDC that works with the property owners to finance and build ADUs, but at scale. Calgary and other Canadian cities have a small grant program, like $20K, towards the construction of ADUs. That’s far ahead of probably any US city. in any case, very nice and thorough piece. I find this long article to be rather biased toward inflating density and ignoring the resulting cost to livability in Seattle. There is value in maintaining current density levels in many areas of Seattle, and developers are intent on doing away with that value for their own profit. Something that never gets pointed out is that much in the original HALA plans and the building of ADUs in particular violates homeowners who have invested in property in SINGLE FAMILY DWELLING zones, because the zoning protected their investment. I would wager that most of the ADU and HALA advocates do not own homes in SF zones and have no investment to protect. They are in the majority, and those who have invested their nest egg (as I have) in these homes are being “thrown under the bus” because they don’t have a “numerous” enough voice – albeit a loud one of protest. One might say that the trajectory of these policies is discriminatory against a minority population, i.e. the SF zone property owner. Right next to my house, an unscrupulous developer who is very active in Seattle (acquiring property that is either distressed or owned by the elderly) recently turned a SF 5000 zoned lot with a home on it with an assessed value under $300K, 6 years ago, into two smaller dwellings, each of which sold for $800K within a year of the start of construction – and currently assessed at more than $1M each today. And I’ll also point out that this wasn’t possible without the developer exercising zoning loopholes that allowed boundary division of property to lot sizes of 4150 sq ft in a SF5000 zone (i.e. minimum lot size of 5000 sq ft). How does this happen? Believe me no-one in the neighborhood was happy about it. No person in their right mind will develop property if it doesn’t pencil out as a significant net gain – unless they are just doing it for themselves for personal reasons – some of which have been pointed out in this article. This profit problem with the HALA plan has been written about previously in Sightline in a well reasoned article. In addition, the ADU argument also ignores the parking situation in these SF zones, where there is typically barely a balance of parking/property as it is. I live in Fremont and the streets are pretty much parked up all the time. It is a warped dream of the foolish to think that people will build ADUs in their back yard to rent out to strangers and that all those renters will be sans-vehicle. Not going to happen. Rents will not be affordable, parking and vehicle traffic will get worse, and the developers will get richer and do more of it. Leave the SF zones alone. Once they are forfeited, they cannot be recovered. Currently zoning policies in Seattle were created for a reason, and people have invested their stability. Adjusting zoning in urban centers may make sense, if developers can pencil out a profit, but even that is in question as pointed out previously in Sightline. I would like to add that my immediate neighbor had an ADU conversion of her basement to provide a separate living space for her daughter. Her daughter later got married and moved out. Did my neighbor rent the space to a friend, stranger, anybody? I even suggested a candidate who needed an occasional place to stay when in Seattle and was willing to pay rent full time. No … my neighbor didn’t feel secure or safe to rent it out to a stranger. So has this particular ADU helped the HALA objectives in any way – no. I live on a street with a few ADUs that could be occupied, in violation of SF zoning. None are occupied, and the neighborhood (which is a tight one) is generally happy that they are not. If they were, many of us would not be able to accommodate guest parking (tough enough as it stands now), and any one of us may have to park our cars on adjacent streets from time to time. I, for one, am not happy with this trend. I have owned my home investment for 30 years, and don’t want to live in a compromised SF zone, where “single family” or “5000 sq ft” have no meaning – even though that’s what the zoning is. M. Cunningham, if density is increased, your land value goes way up. Doesn’t that benefit your nest egg concept? Furthermore, what you do with your nest egg is fine, but why do you have right to mandate what your neighbor does with theirs? Roman, it is disingenuous of you to pretend that we all live in a vacuum–that our homes and what we develop, build, or change on our land has no effect on anyone else, each kingdom unto itself. No. Every time I see a four-story, $1 million +, “rooftop deck views” monstrosity built next to lovely little historical homes by a predatory developer I fume. There are people that live in the shadows of those homes now, who have giant walls to greet them instead of a lovely hedge and a familiar kitchen window. In a similar vein, people who move into SF5000 zones do so because they want to live in lower-density areas with human-scale architecture. Yards. People they get to know who are similarly invested in the neighborhood. Sure there are renters, but anecdotally I have found that typically a) most on a given street are owners and/or b) with rents a bit higher, people who pay the first/last/deposit to move into a place aren’t moving away quickly and thus have a longer-term investment in the neighborhood themselves. For the record, I am for DADU’s, but I strongly oppose the removal of the owner-occupied law, and would like to see a parking requirement which is one per property rather than one per unit. But I have seen what developers will do with loopholes and manipulations, I am not interested in rolling out the red carpet to turn a street full of single family homes into what amounts to a flat apartment complex. Some want the rules so lax that you could essentially have two duplexes on one SF lot (a home with an ADU, a DADU big enough to split into two rentals), no parking requirements so the streets are packed with cars, all owned by a developer in China making a tidy profit off our urban density. Pretending that doesn’t effect everyone in the neighborhood and that Michael is just being a control-freak is willfully ignorant. Shay, you’re not seeing it from an investor’s perspective. I recently bought a single family home in the area with a good size lot. I wanted to build an ADU and rent them both out. However, because of the owner occupancy rule, I can’t do that. Now, the best thing for me to do is to demolish the house and put up two townhouses. Also, if it’s not an owner-occupied property, the person living in the first house is already a renter anyways. Dan, this is a wonderful article. Thank you and Sightline for delving into this issue and providing data to support the concept of adding more affordable housing in our SF neighborhoods. And while an ADU or DADU in Queen Anne (where I live) may not result in lower income housing, it will most definitely result in more affordable housing for the middle class, working folks who want/need to live closer to their jobs and services. Great piece about ADUs. We had a backyard cottage in the house I rented in Wallingford for 4 years, as well as a basement unit, and I loved having neighbors on-site. I never understood why people were so anti-ADU. Along the same thinking, adding new highways lanes reduces traffic, full stop. But we know that’s not true – induced demand means we’ll bring more cars and more traffic and end up not really better off. Similarly, it is 100% true that adding new *deed-restricted affordable homes* reduces net displacement full stop. But adding market-rate homes that wealthy people move into from somewhere else, or from here and free up their home for wealthy-ish people to move into… doesn’t necessarily do anything against displacement. In a market as hot as Seattle, adding supply at the top doesn’t necessarily equate to affordability gains, even though econ 101 theory might suggest it would. We need to look beyond just the bare market, and add in deed restrictions so we actually get what we need. Induced demand is factor with highways and traffic because the same number of people make more trips as you add lanes. It is not a factor with housing because the same number of people do not occupy more homes as we add them. Thanks for the thoughtful comment, Skye. The only way new housing doesn’t reduce displacement is if the people who would have lived in the new homes go live somewhere outside the city when new homes are not built. Since the people who move to new housing are relatively wealthy, it makes no sense to me to assume they would just give up on Seattle like that. What makes you think they would? I see market supply and subsidized housing as a both/and. I have a legal ADU in basement and would build a cottage in my backyard immediately if I could. I have lived in my house since 1991 and love having the neighbors as well as the income! I do not think any of my neighbors would not welcome more low-level density like this in our East Ballard neighborhood. ADUs are FAR superior to the box townhomes and condo sprouting up the rest of Ballard. I so disagree with the above quote. The development being done in Ballard and West Seattle favors very, very wealthy owners and developers most of all. Low income housing development is almost slim to none. So, density in general is NOT a win for “housing equity”. On the other hand, I do think ADU’s are great and will support, while opposing up-zoning with committment and energy. Thanks to Amazon Smile Foundation for supporting a sustainable Northwest.